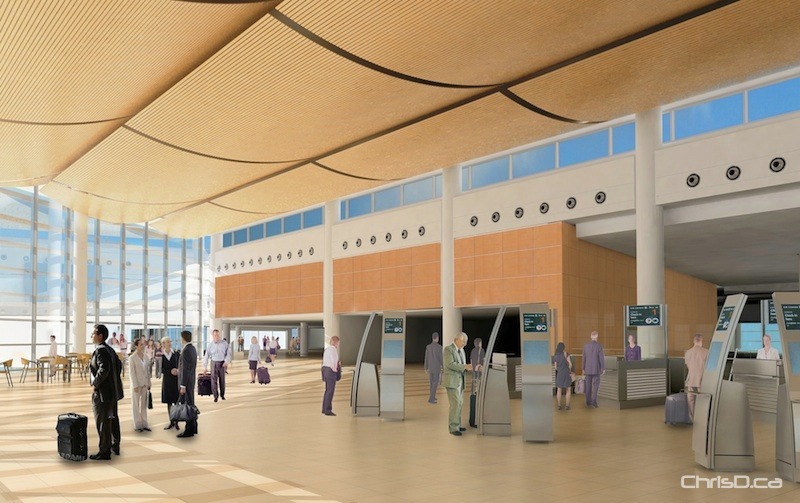 The new air terminal building at Winnipeg’s James Armstrong Richardson International Airport is nearing completion. The ultra-modern, energy-efficient structure is a little behind schedule, but visitors will likely forget about the delay once they step inside the spacious structure. The Winnipeg Airports Authority invited our camera along for a behind-the-scenes tour of the building this week to show off its bells and whistles — and believe us, it has many of them. From the open lighting concept, to amenities galore — including free Wi-Fi Internet — the new air terminal building cannot even begin to be compared to its older sibling next door. The massive $585-million project boasts all the conveniences of today’s modern airport. The upper level for departures and lower level for arrivals will ease up on traffic congestion seen in front of the current terminal, where it’s sometimes difficult to find a drop off spot, even in the designated loading zones. While the new building is a much-needed improvement, it still features at least one aspect of the current design. The arrivals area maintains the escalators the public is used to seeing family and friends come down after they arrive home. It has become a tradition to welcome athletes, celebrities and loved ones by seeing them take the ride down the moving staircase. In comparison, most other Canadian airports offer a less inviting area for arrivals. Calgary, for example, has their escalators behind a frosted security door until passengers make it down. Although the new building hasn’t officially opened it, the first passenger arrived last July. Queen Elizabeth II made her grand entrance into the new terminal during her Canadian tour. She also placed a letter to the youth of Manitoba in a secure time capsule inside the building, which won’t be opened until 2060. Another hot item on the minds of many Winnipeggers seems to be the food choices offered at the new airport. It’s not a secret, but many forget the list of concessions has been known for nearly two years. 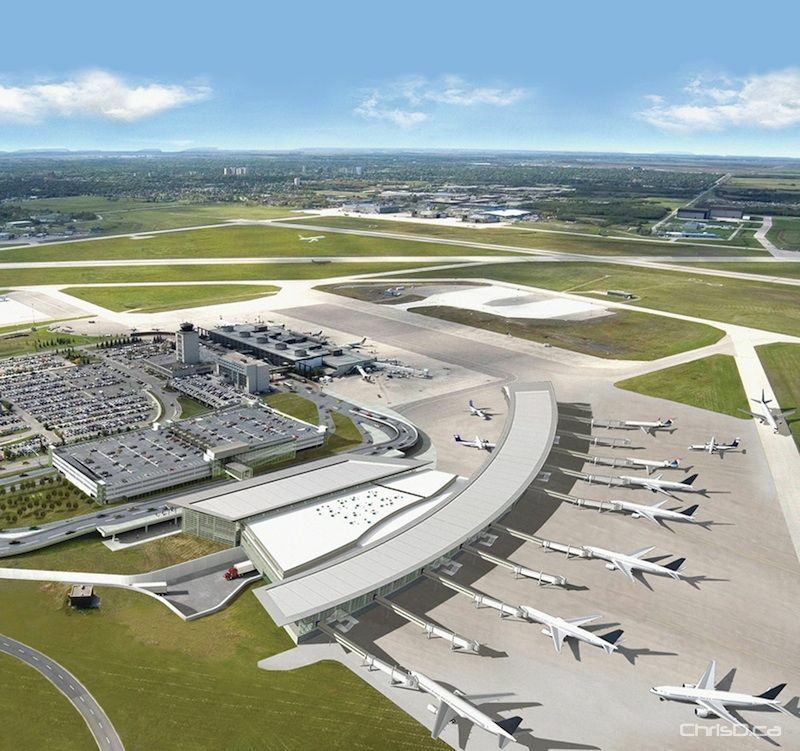 The Winnipeg Airports Authority has previously announced partnerships with many vendors, including TGI Fridays, Upper Crust Bakery, Stella’s Café and Bakery, Tim Hortons, Salisbury House, Gondola Pizza, Rice Tales, and Starbucks. On the retail side of things, visitors can look forward to big-name stores like the PGA Tour Shop and CNBC News to operate inside the terminal — all under the guidance of the Paradies Shops. Toad Hall Toys, Rocky Mountain Chocolate Factory, Indigo Books & Music and the Manitoba Liquor Control Commission will also be included. No firm opening date for the new air terminal has yet been provided. Construction was set back when contractor Ellis Don found leaky drain pipes under the concrete pad the terminal sits on. Significant progress has since been made to remedy the issue.